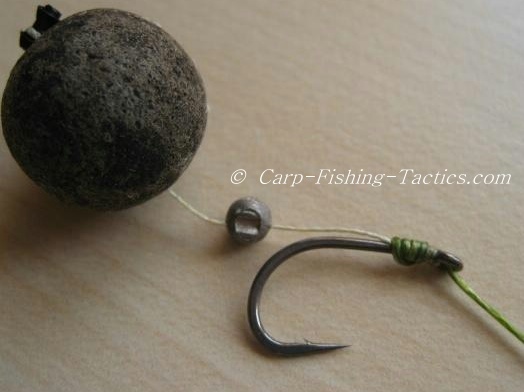 This is a simple, but very effective rig for catching carp. It catches carp out because of the buoyancy of the pop up, the bait flies into a carp's mouth very easily. The other good point about this carp rig comes from the weight of the shot, it pulls the hook downwards when inside a fish's mouth, this means the point of the hook can be in contact with the bottom of the lip quickly. 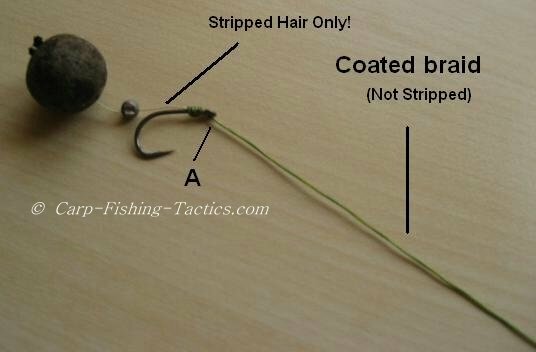 At point "A" in the picture above, the coated braid is not stripped as it leaves the eye of the hook. This causes the hook to turn quicker because the hook link leaves at the right angle. It almost gives it that line-aligner effect. The coated braid is stripped just enough for a hair to be tied. Strip back the coated braid enough for the hair, then position the end of the stripped section at the eye of the hook, and start whipping a knotless knot to trap the coated braid. This should cause the whole rig to feel stiff. In other words, the hook and hooklink together should feel robust and not feel limp by the eye of the hook. On this rig I don't use a piece of tube or rig ring on the shank of the hook, I prefer to give the hook freedom to drop and grab hold quickly. I like to place the shot just after the bend of the hook but not too far away or it that may allow it to swing around the hook during casting. In any case, you want to PVA foam it up before casting to hold the vulnerable bits together! Once the rig is tied you must test it in water to make sure it presents the bait properly. 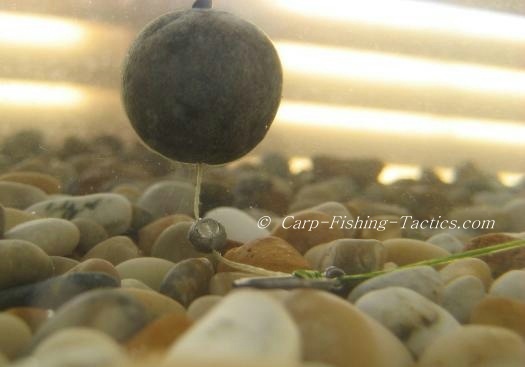 In the picture above, you can see the shot is not quite heavy enough to pull the pop up down onto the gravel bottom. The weight of the shot will need to be heavier. NB. That cloud coming out of the pop up and going down towards the shot is just the flavour and attractants leaking out of the bait. It lasts for a few minutes. The picture has not been digitally altered in any way! The picture above shows the correct way I present an over-weighted pop up bait. The shot is now weighted just enough to sink the pop up, but the rig is still buoyant enough to catch out a wary carp feeding in the area. I prefer it when the rig sinks slower than normal but not too slow, I want the hook to drop quick enough when inside a carp's mouth. As a last touch, I sometimes colour the hair to match the bottom of the lake bed! 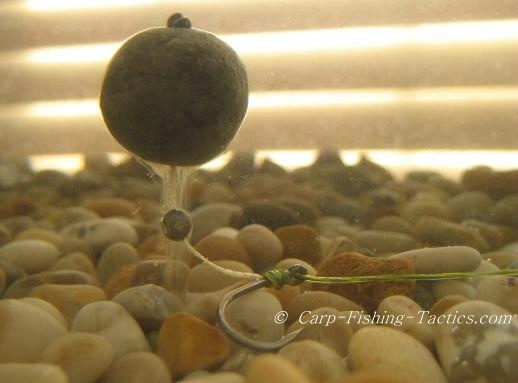 Try this over-weighted pop-up rig presentation if you're getting tons of little bleeps. I think you'll be surprised at how effective this carp rig can be. Let us know if you catch a big carp using this, or any of our rigs! When is it best to use a Pop-Up or Bottom Bait Rig? Give an advantage for catch rates!